Identity/Class: Human, mutated by radiation accident. Powers/Abilities: Cat Claw can see almost as well in the dark as she can in the day, she is superhumanly strong and fast, and she is as agile and supple as a cat. Her fingernails are clawlike and capable of cutting through skin. History: Carol Connor is a shy and quiet university biology student. She shares a flat with the extroverted Jeanny Jones, and because of her friendly nature is a favourite of her teachers and most of the people who know her. However, one night at the university she is attacked by a cat which had been used in some experiments, and is scratched. Later the same evening she is exposed a form of radiation (known as Sigma Rays) while trying to shut down some instruments used in an experiment by Doctor Baker. These events result in her gaining superhuman powers, much like those of a cat. At first Carol just enjoys having the powers, with no real intention of using them for anything more serious. 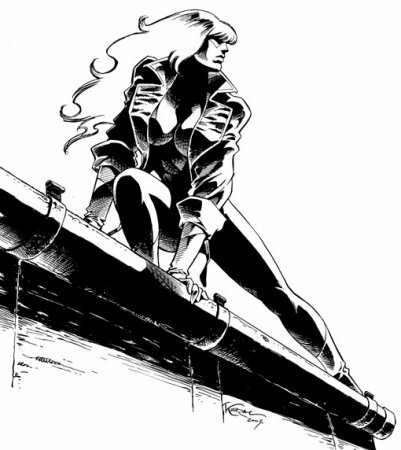 But when she hears Jeanny being attacked outside the building where they live, she jumps (literally) to her defense and drives the bad guys off. Realising that she enjoyed the experience, she decides to adopt a costumed identity (deliberately revealing to draw attention away from her face, and because the quiet Carol would never wear anything like that daring), and becomes Cat Claw. The mask, gloves and boots which make up her costume are made from a special fabric/metal which she stole from Grays Institute. There was insufficient fabric to make a complete suit. Comments: Created by Bane Kerac. Carol has a habit of falling out of her skimpy costume quite regularly. Cat Claw was one of three new strips proposed by prospective writers to Yu Strip Magazine in what was then Yugoslavia. Beginning as a foreign take on the Marvel style of comics, Bane Kerac swiftly moved into broader parodies of many topics. 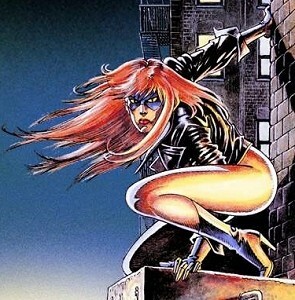 Cat's Claw has now had forty-four published adventures, the last being "Catsolute Power" in October 1994. Another graphic novel is planned continuing her story, but has yet to be published. For a full run down on her adventures check out Bane Kerac's own page on her history. Bane informs me that "Strip zabavnik" magazine from Novi Sad (YU) published the ninth episode drawn by Radic Mijatovic and scripted by Bane Kerac.